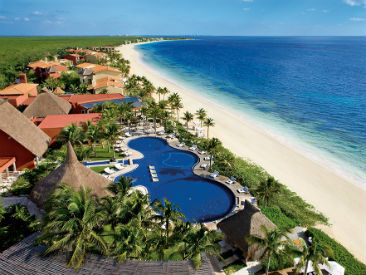 Zoëtry Paraiso de la Bonita is an all-inclusive, exclusive resort, featuring boutiques situated on the white-sand beaches of Riviera Maya. Consistently named one of Mexico's most exceptional boutique resorts, the ten-year AAA Five Diamond Award winning Zoëtry Paraiso de la Bonita is an original escape to paradise. 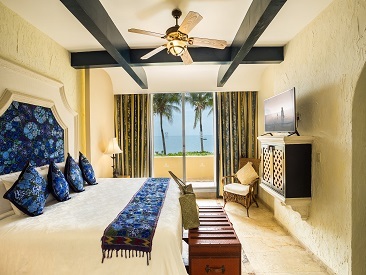 Intimate and elegant, this resort offers 100 oceanfront suites, all individually themed and decorated. Pamper yourself with the selection of massages, body therapies and more with the Thalassotherapy Spa or indulge in one of the four standout, gourmet dining venues. At Zoëtry Paraiso de la Bonita, nothing is too extravagant for relaxing in paradise! Zoëtry Paraiso de la Bonita was AM Resorts' first property to operate as a Zoëtry Wellness and Spa Resort, their exclusive, high-end lifestyle resort brand launched in 2008. Zoëtry Paraiso de la Bonita is the brand's marquee property, offering guests a new type of luxury experience that combines elements of wellness, serenity and social and environmental responsibility treating every guest to an indulgent experience without the guilt. Consistently named one of Mexico's most exceptional boutique resorts, the AAA Five Diamond Award (for 15 consecutive years) winning Zoëtry Paraiso de la Bonita is a truly original escape nestled in Bahia Petempich. This intimate and elegant all-inclusive Zoëtry Paraiso offers 100 oversized oceanfront suites, each one individually themed and decorated. The grounds and surroundings echo the rooms in providing a truly unique atmosphere. From 12th century Balinese lions to ancient Egyptian hippos, you will fall in love with the casually elegant ambience the resort has created. When relaxation is what you crave, saunter over to the 22,000 sq. ft. state-of-the-art Thalassotherapy Spa. Pamper yourself with a wide selection of massages, body therapies, as well as a hydrotherapy circuit featuring a heated saltwater pool. Four standout dining venues offer a gourmet sampling of regional Mexican delights and international fare in an informal setting. Stay for a week and you will never want to leave. Proclaimed 'One of the Coolest Places to Stay' by Conde Nast Traveller. Zoëtry Paraiso de la Bonita provides guests with Endless Privileges® designed to create unparalleled experiences focused on luxury, wellness, romance and enrichment in an ideal beachfront setting. The incredible rooms are all one bedroom suites or larger, with a minimum 1100 sq. ft. of space. Each features a separate living room and bedroom with a decor scheme that leans toward the eclectic. Luxurious bathrooms feature deep stone tubs and swiss jetted showers. All suites offer private balcony or terrace with either oceanview or private plunge pool. Each suite is personally decorated with unusual handpicked antiques, cool marble and luxurious fabrics and treasures gathered by the resort's owners during their travels around the world. 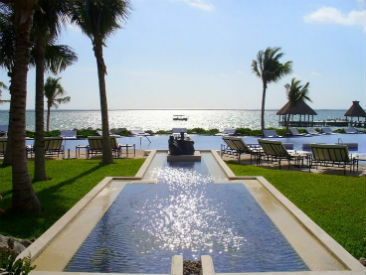 Combined with an eclectic Mexican style, the various elements create a haven of pure serenity and luxury. Oversized glass and marble bathrooms offer a private oasis with marble tubs for two and soothing jet showers. Guests have the opportunity to enhance and customize their Endless Privileges® stay with options to upgrade through the Lovers, Cultural, Girlfriend's Getaway, Spa, Golf Experiences and more! See the Activities & Recreation tab for additional information. As part of Endless Privileges® guests of Zoëtry Paraiso de la Bonita Riviera Maya have access to all other AM Resorts in the Cancun/Riviera Maya region for a total of 63 dining options.The Sip, Savor & See Dining Experience includes complimentary dinner, drinks and entertainment at a restaurant or bar at a resort of their choice. Guests can utilize the facilities at the resort they are visiting from 6pm to 1am. The experience is only good for dinner via reservations made through the resort concierge. Guests are responsible for the cost of transportation to and from the resort for a maximum of four people per seating. The Naturalismo Gallery, inspired by Luis Sottil, will be on exhibit at Zoëtry Paraiso de la Bonita permanently. To pair perfectly with this visual delight, Zoëtry has created a special cocktail and optional dinner pairing. This “Delectable Beauty” dinner is a five-course meal hosted in the wine cellar following the art tour, with all dishes inspired by the pieces in the exhibit. Guests can take part in the Delectable Beauty dinner for a per person cost. With 90 luxury beachfront suites, the resort offers a completely new kind of vacation experience focused on wellness, serenity and romance, as well as social and environmental responsibility. Children 2 and over are permitted at this resort, however, there are no special facilities for children and they will be charged as adults. Guests of Zoëtry Paraiso de la Bonita Riviera Maya now receive complimentary greens fees at the beautiful Cancun Country Club El Tinto Golf Course! Pricing varies by season and tee time. Individual reservations can be made up to 60 days in advance through the resort's concierge and are subject to availability. No name changes to existing bookings will be allowed. A no-show penalty will be charged to your room. To avoid this fee, guests must cancel at least 24 hours before the booked tee time. Additional supplements and policies (including separate cancellation policies) do apply for groups of 16 or larger. Zoëtry Paraiso de la Bonita Riviera Maya now welcomes small dogs (under 22 lbs. or 10 kg) in their accommodations and on property. This service is available for $75 USD per night in the required room category. Please contact the resort directly to confirm necessary room category. To reserve a room for a guest with a dog, please email info.zopdb@zoetryresorts.com. To check availability, you can contact reservations before booking. For full details and restrictions, please visit Zoëtry Paraiso de la Bonita Riviera Maya’s accommodations page. Please Note:The use of drones or apparatuses that fly or float in or on the premises of AMResorts hotels is strictly forbidden, except for those that have written authorization from the General Management of the hotel.